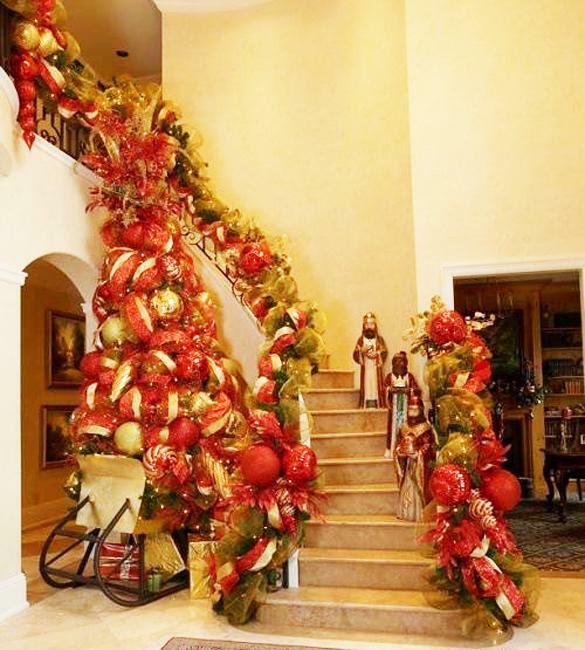 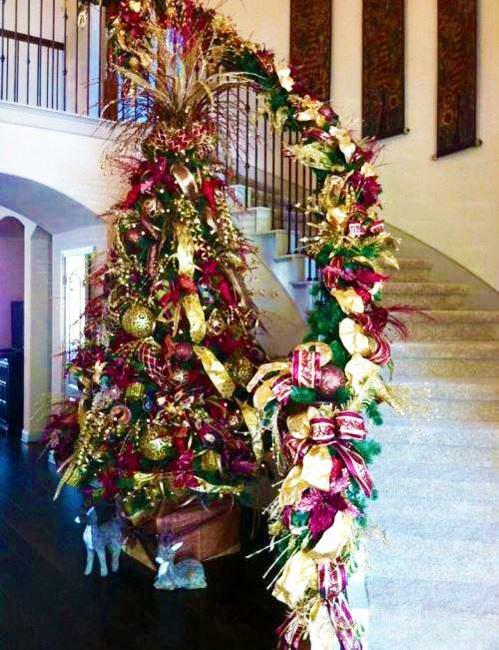 Festive staircase designs make a huge impact and add fun to Christmas decorating. 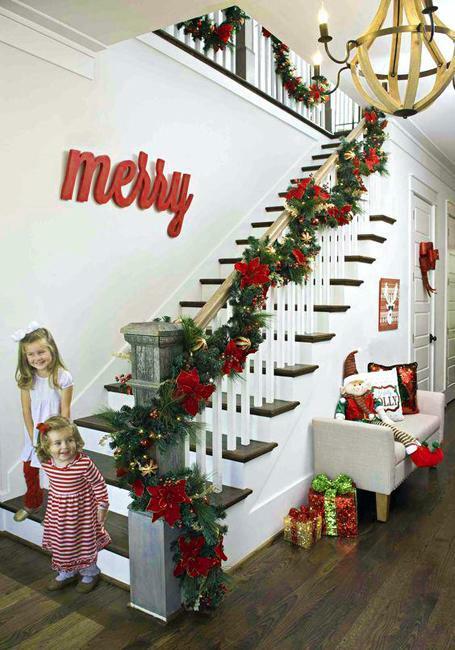 If you like to decorate for the winter holidays, you will appreciate these beautiful ideas for stairs decorating which offer easy, quick, inexpensive ways of transforming your staircase. 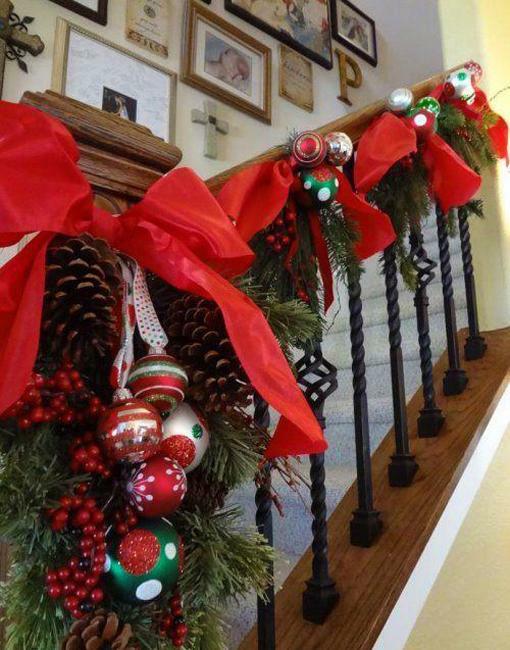 All you need is double stick tape, colorful ribbons, wire hooks, clear fishing line and twist ties to attach your Christmas decorations to the railing. 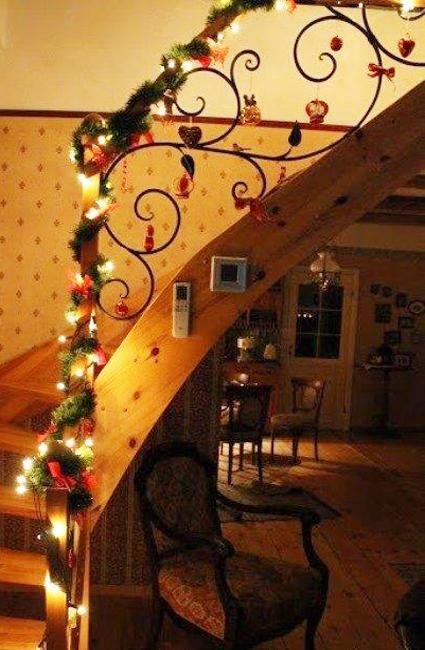 It is ideal if the supplies match your Christmas decorating colors. 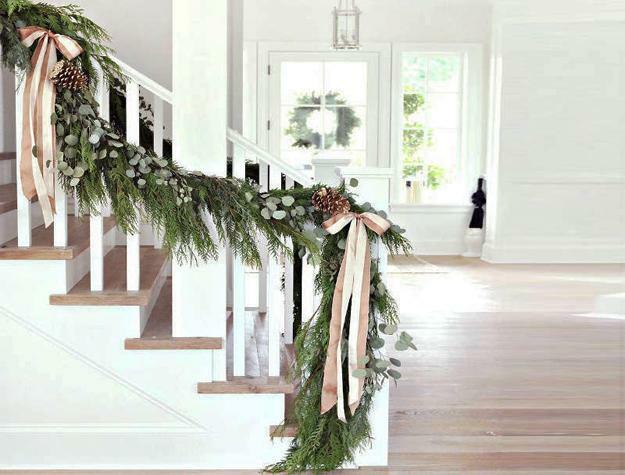 The simplicity and beauty work together when add a layer after layer to your staircase design. 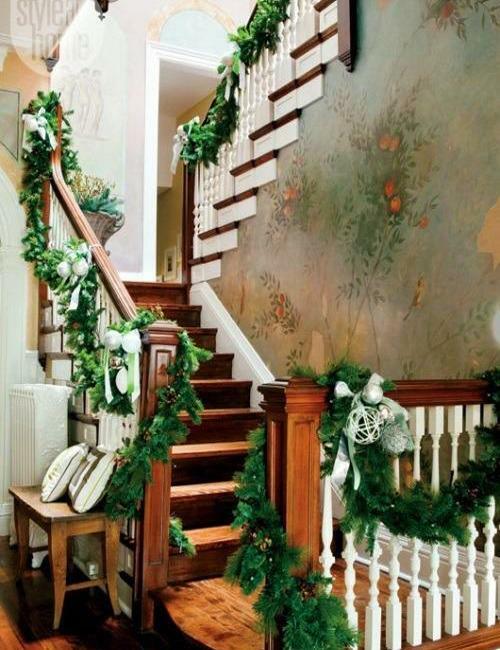 Starting with green garlands, you can add to a handrail as many Christmas decorations as you wish. 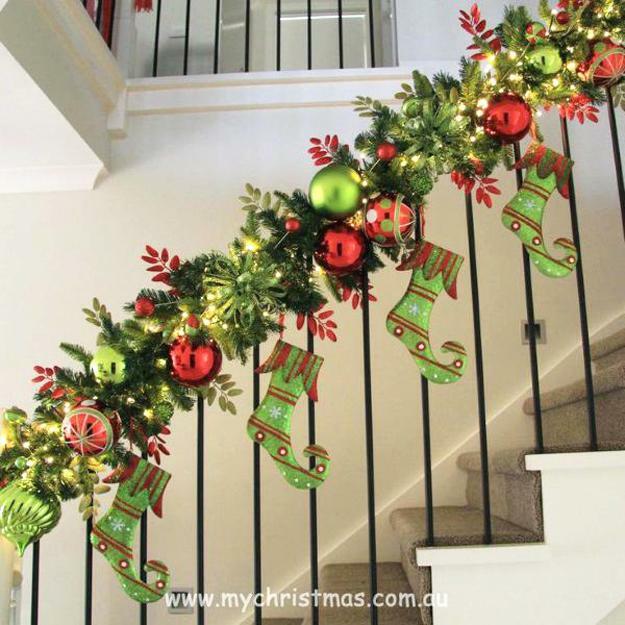 You can twist green garlands around a railing and balusters creating a beautiful base for decorating with colorful Christmas ornaments, string lights, and ribbons. 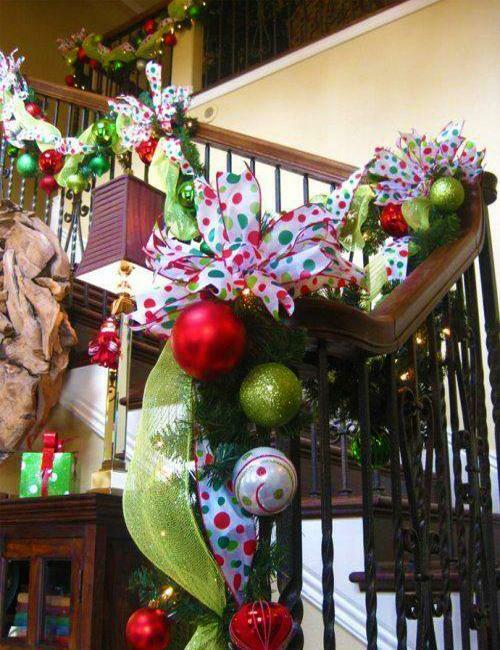 Floral arrangements, Christmas ornaments, handmade paper garland, and ribbons look gorgeous on the green base. 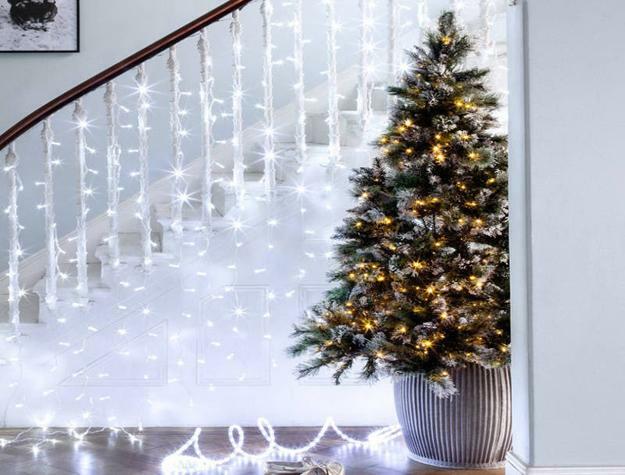 Evergreen branches and artificial designs mixed with lights turn festive staircases into beautiful, bright, and eye-catching displays. 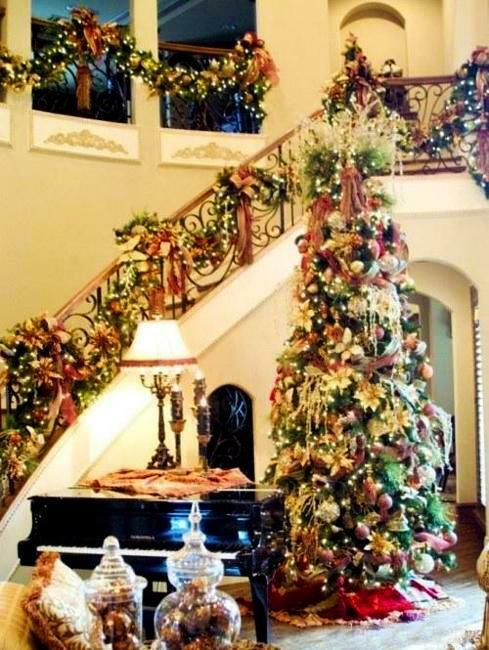 Add lush branches and Christmas balls, snowflakes or bows to the railing and posts. 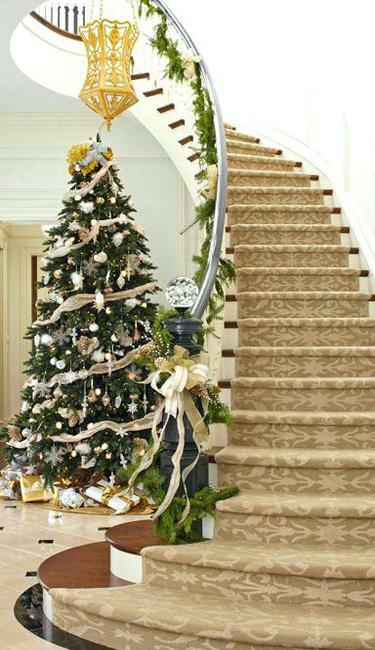 A drop of essential oil is an excellent idea for making fragrant and beautiful decorations for holiday staircases. 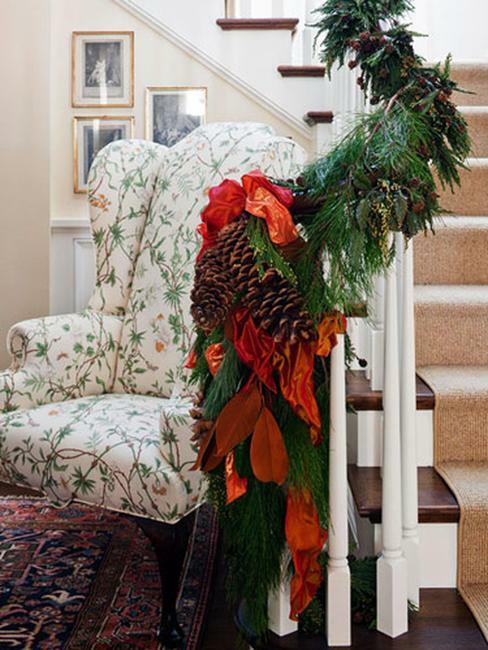 You can add natural items, like pine cones, branches with berries, Eucalyptus leaves, and designs made with natural fabrics. 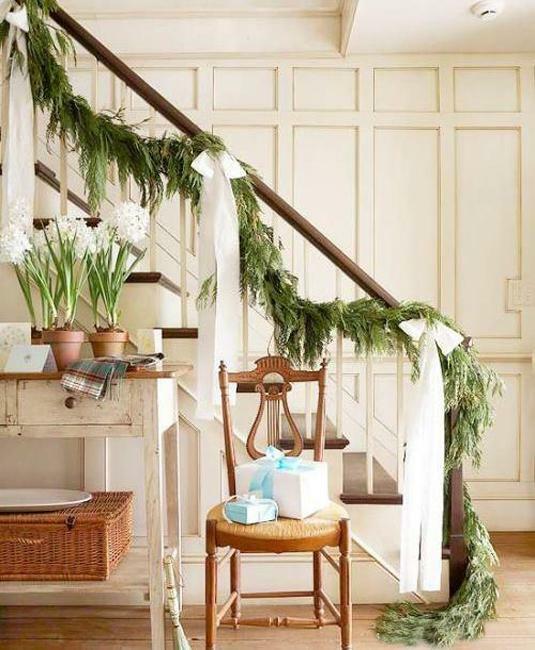 Burlap accents look beautiful with green Christmas decor. 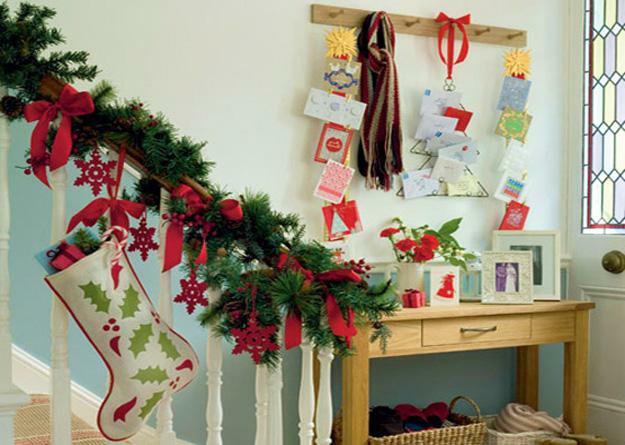 Paper crafts are excellent Christmas ideas also. 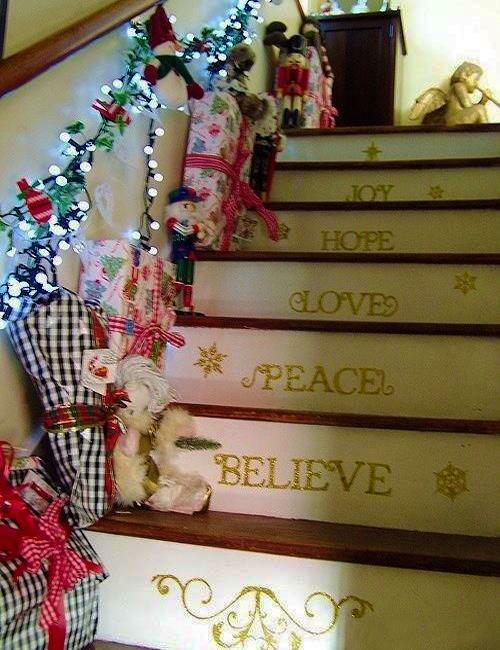 Holiday ornaments that hang on the staircase handrail bring a charming vibe of the old-time Christmas. 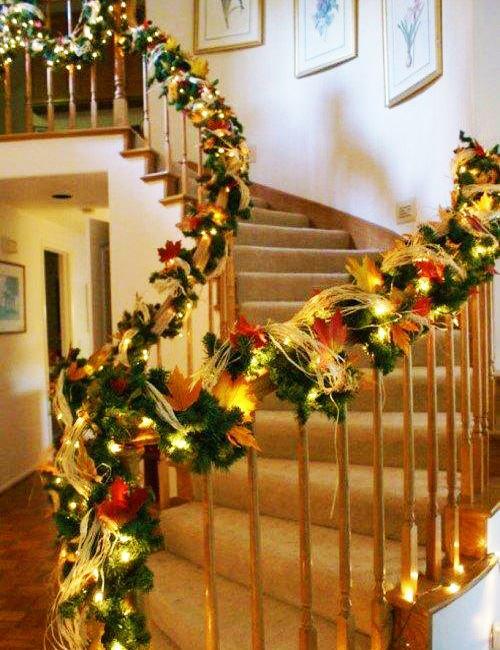 Colorful ribbons in red, green, blue, pink, silver and golden colors complete the festive staircase decoration. 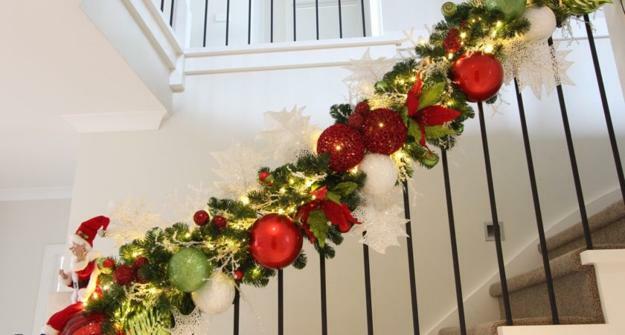 Fabrics in Christmas colors are fast, easy, cheap ideas for creating beautiful holiday decor and cheer up Christmas staircase designs. 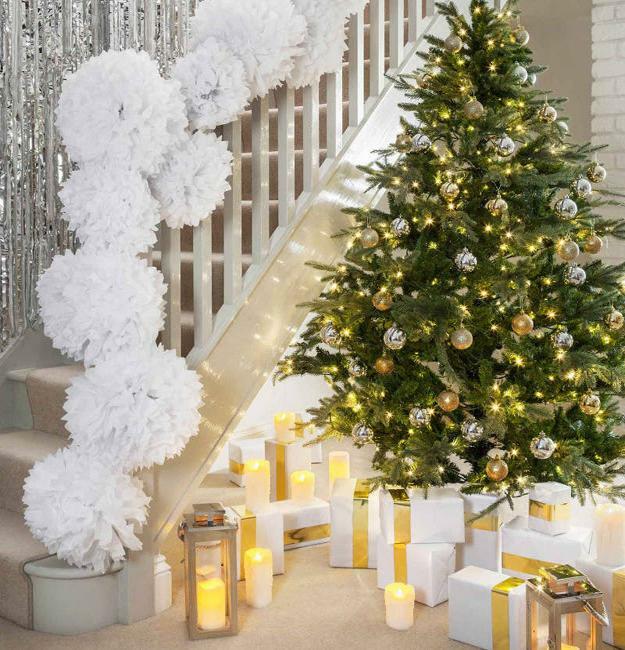 Choose wide ribbons with wiring and sparkly metallic accents to add additional glamour to Christmas decorating. 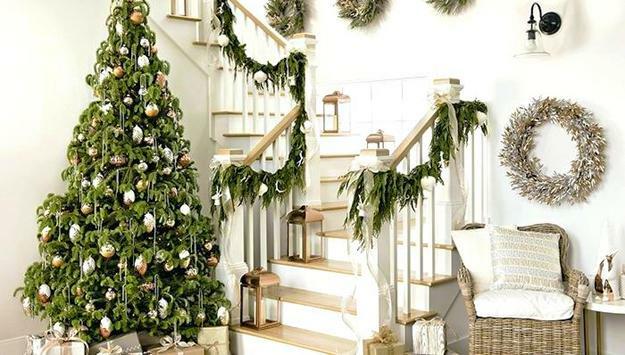 You can give a contemporary touch to Christmas decorating ideas by mixing ornaments in different styles and creating layers of colors. 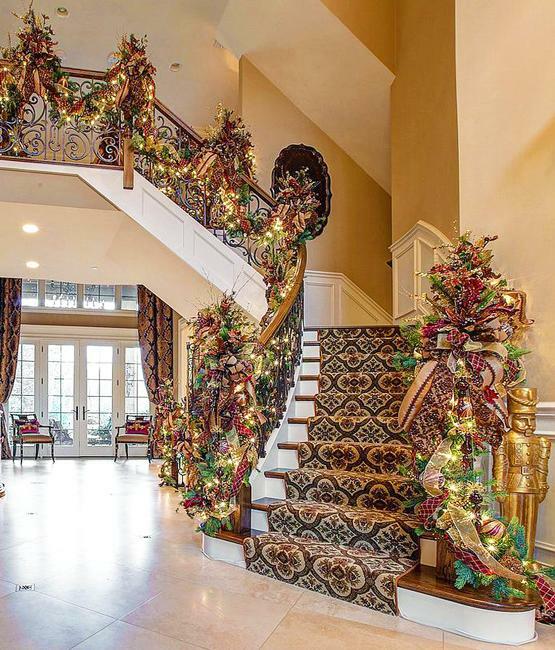 Blending textures, designs, and colors add chic and elegance to modern Christmas decor. 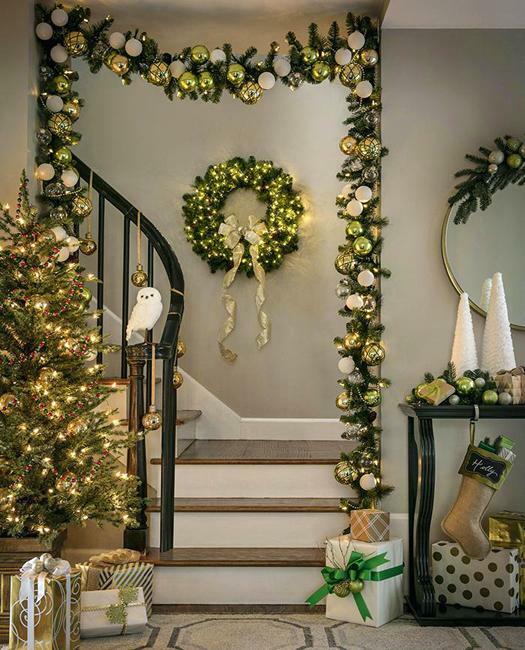 Wired ribbons in silver and golden tones add gorgeous, rich, and elegant curves to the festive Christmas look and elegantly style your holiday decor. 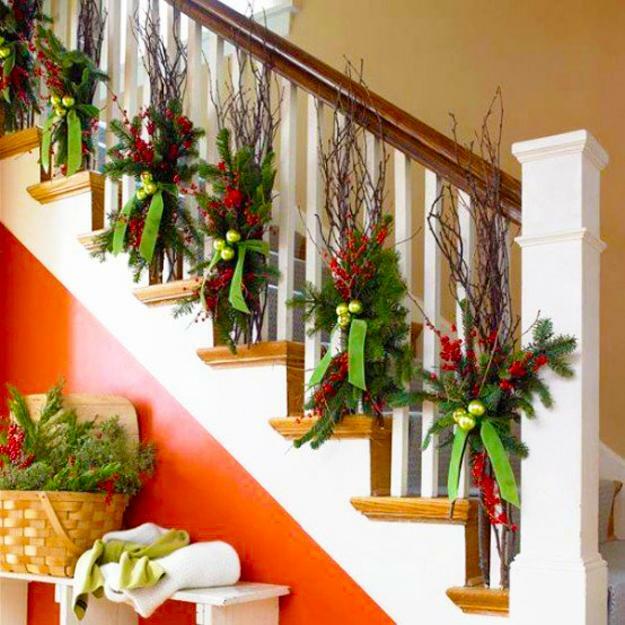 Decorating with candles adds a warm, homey vibe of traditional holiday decor to your staircase. 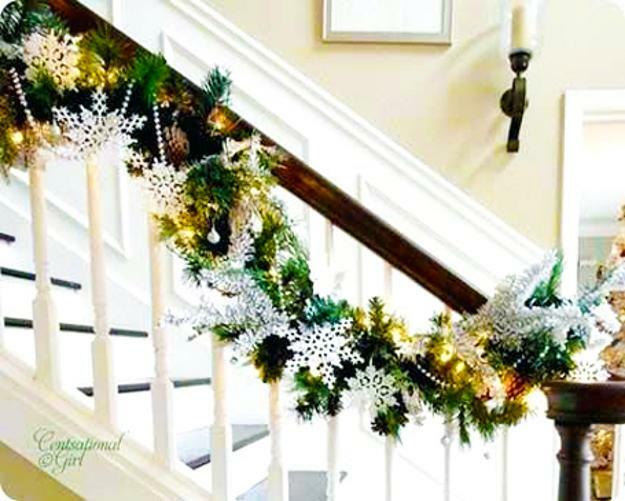 Decorative candle holders with winter-themed cutout designs look attractive and elegant on steps and create a warm glow adding coziness and charm to Christmas decorating. 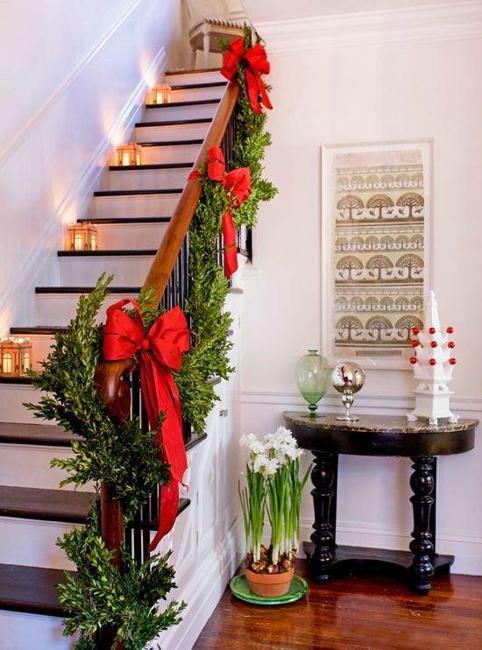 A combination of Christmas decorations, string lights, and candles give a bold and bright look to winter holiday staircase designs. 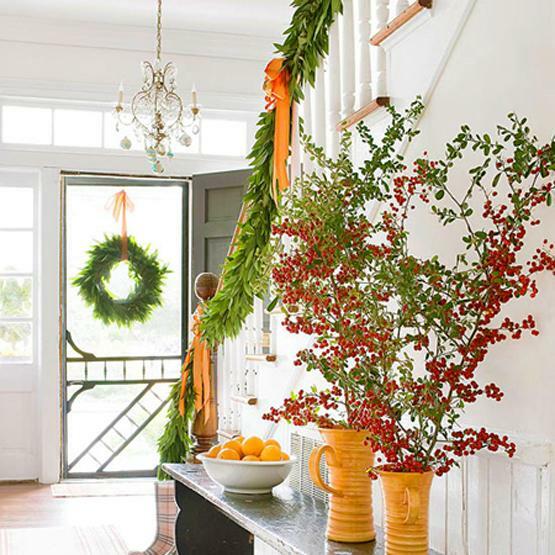 Originality is one of the trends in decorating for winter holidays. 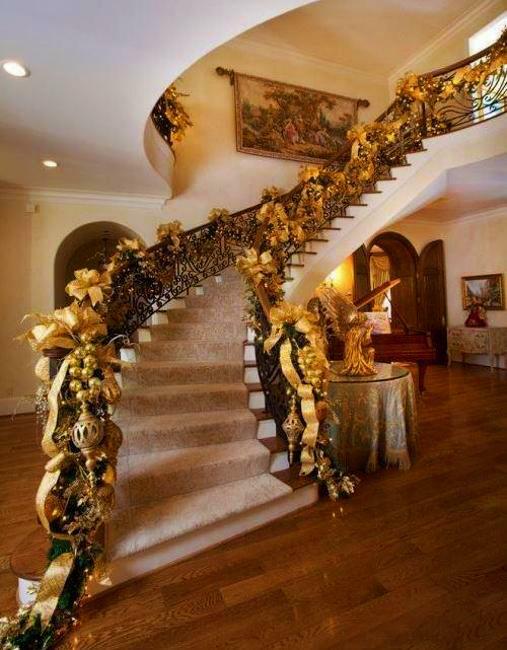 You can add surprising accents to your staircase decorating. 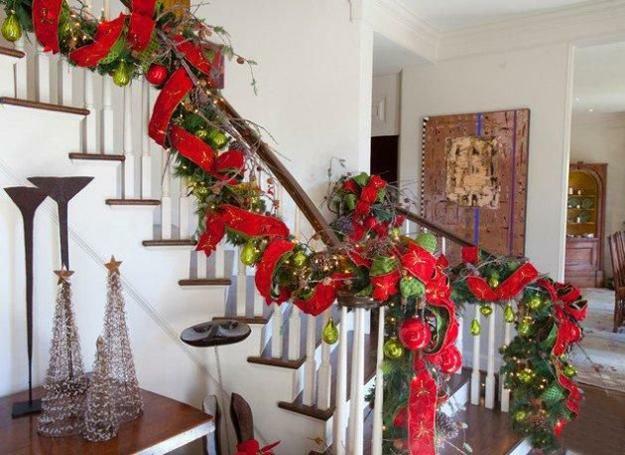 Get creative, design unique garlands with unexpected objects and make a statement. 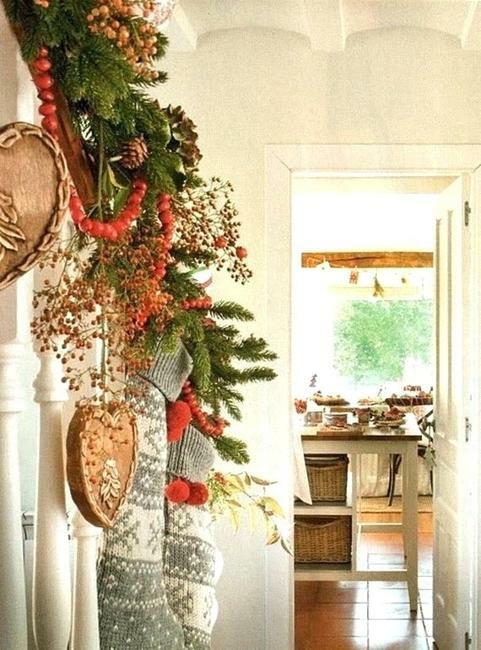 Winter branches, fall leaves, paper crafts, old Christmas ornaments, new accents, – anything can inspire you. 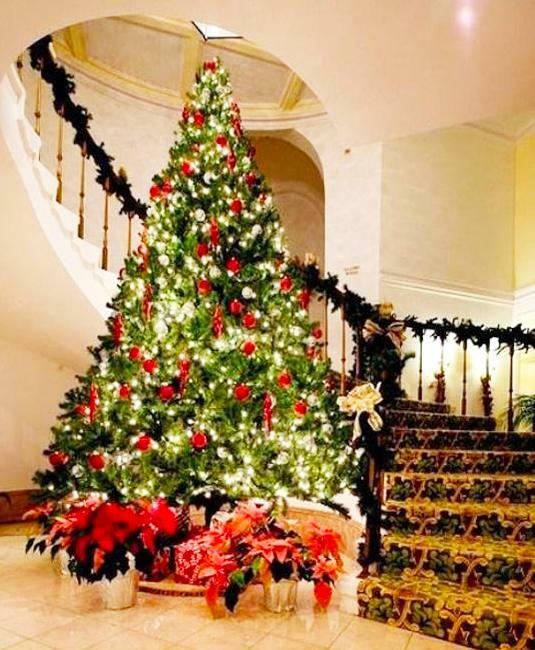 Winter holidays are about having fun and feeling joy. 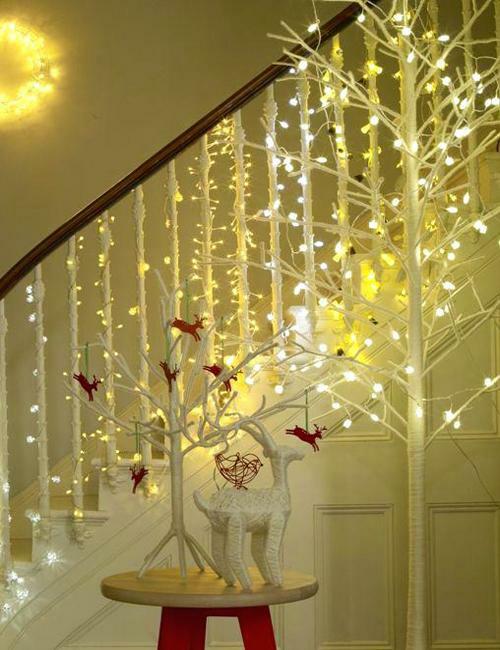 Festive staircase decorating can be traditional, transitional or contemporary and original. 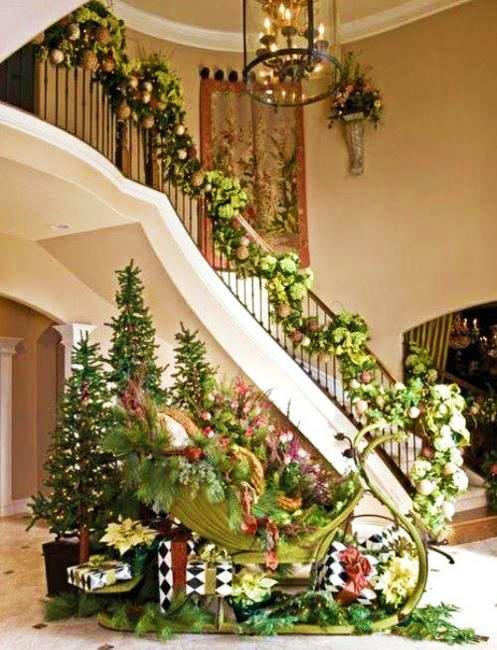 Railings and balusters, stairs and walls adorned with Christmas ornaments and green garlands create a superb display. 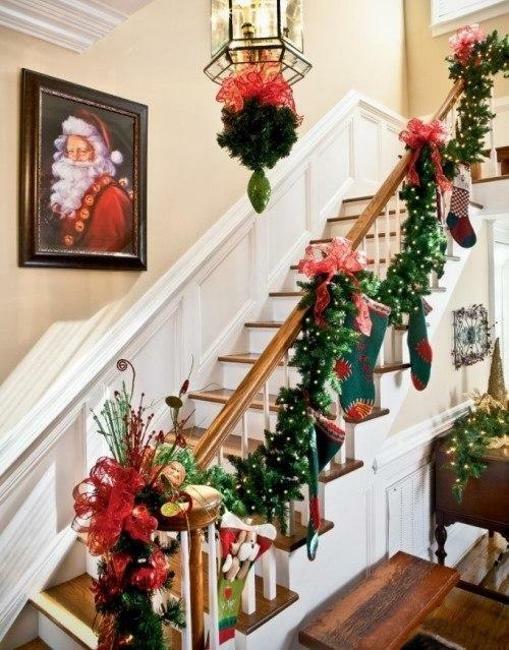 Hang your favorite Christmas decorations from the edge of your staircase and design will look beautiful, unique, and original.